Father Gallitzin's house and church were then in a completely isolated site, far out of reach of ready assistance. A party, therefore, thought well to call upon him in his lonely residence, and to demand accession to their wishes, with no idea of limiting themselves to mere words if he refused. After opposing and defying them, and scorning to enter into any thought of compromise with them, he in an almost exhausted condition succeeded in reaching the church, to die at the alter should they dare to attack him in the house of God. 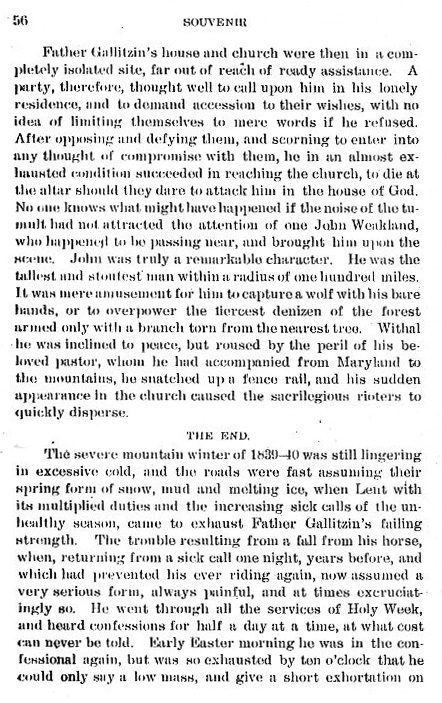 No one knows what might have happened if the noise of the tumult had not attracted the attention of one John Weakland, who happened to be passing near, and brought him upon the scene. John was truly a remarkable character. He was the tallest and stoutest man within a radius of one hundred miles. It was mere amusement for him to capture a wolf with his bare hands, or to overpower the fiercest denizen of the forest armed only with a branch torn from the nearest tree. Withal he was inclined to peace, but roused by the peril of his beloved pastor, whom he had accompanied from Maryland to the mountains, he snatched up a fence rail, and his sudden appearance in the church caused the sacrilegious rioters to quickly disperse.